Though we don’t usually review beer and cider, sometimes when a rep reaches out and asks if you’d like to try out a new drink, you’re just in the mood to try out a new drink. That’s exactly what happened with Woodchuck Cider’s newest addition, Hopsation (5%ABV). 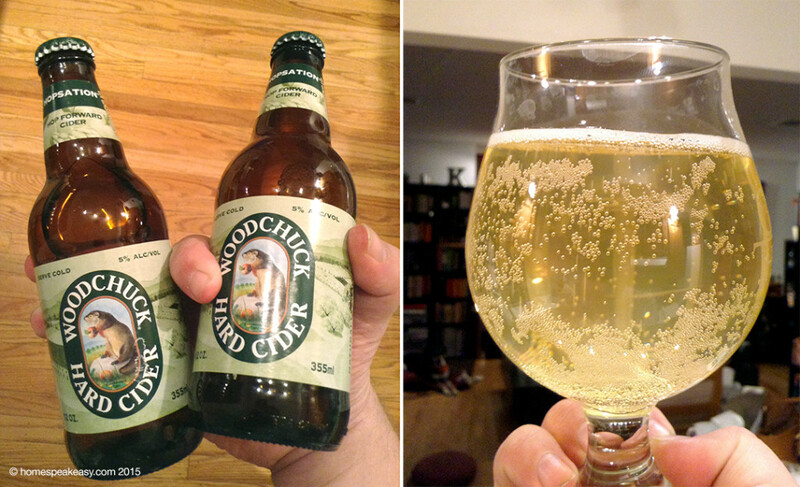 If I’m being honest, I’m not entirely sure why I was interested in trying it, because while I do enjoy ciders, I find most Woodchuck expressions to be too sweet, and I am not the biggest fan of the current style of A MILLION HOPS FOREVER that seems to have taken over the beer industry. Lucky for me, Hopsation seems to have predicted this and decided it would prove me wrong. Right off the bat, it smells different than most ciders. It has the sweetness, but also a large floral component that really made it smell like a carbonated Gewürztraminer (which is a semi-sweet, floral German wine that I happen to like, for those who haven’t tried it). The taste wasn’t far off from the nose, either. It wasn’t as sweet as I expected, but not particularly dry either. Floral and very crisp, the hops did not impart any bitterness to the Hopsation at all, but rather a bright grapefruit/citrus tone. The most surprising thing wasn’t that the sweetness was under control or that the hops actually gave it an interesting flavor, but how restrained and subtle it was. Whenever I see a beer with a gimmick, I expect it to be heavily leaned upon, like cloying nutmeg Christmas ales, or pumpkin beers that taste like they’ve had a whole container of pumpkin pie spice dumped into them, but in this case, the gimmick actually improved the product. If you hadn’t gathered by now, I was really expecting not to like the Hopsation at all, but I’ve got to say, I think I may have a reason to buy a case of Woodchuck Cider for the first time in many, many years.